From isolation to integration to sanctions, Russia has experienced testing economic times. GC speaks to honourees of the Legal 500’s GC powerlist: russia to explore the challenges and opportunities. Businesses must think collaboratively to achieve success in today’s – and tomorrow’s – networked world, says management guru Don Tapscott. We examine how his theories might apply to GCs. How do you make that leap to the top job? Mike Fahey, former GC and principal at executive and board search firm RSR Partners, gives some valuable career tips. GC discusses delegation, disruption and strategic input for cross-border legal teams over dinner with leading in-house and external lawyers in New York. David Kultgen has practised in-house in Saudi Arabia on and off since the 1970s, almost immediately following his graduation from law school in the US. A veteran in-houser at oil giant Saudi Aramco, he has recently overseen a huge transformation and expansion of the company’s legal function. 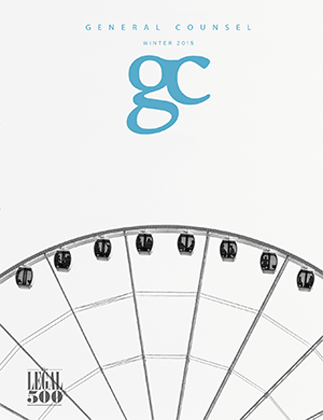 GC gets the lowdown on market conditions in one of the world’s richest countries from GCs profiled in The Legal 500’s GC Powerlist: Switzerland. Case and matter management software specialists Iken talk us through some of the dos and don’ts when it comes to finding the right case management system. GC looks at the emergence of alternative legal service providers in Asia Pacific. It’s a hot topic for any corporation that wants to avoid being splashed across the press… or dragged through the courts. We speak to GCs in the US, Asia and the UK to find out their top tips for avoiding the dreaded data breach. On 16 September 2015, GC, The Legal 500 and Legal Business held a roundtable discussion and dinner for in-house lawyers on the topic of anti-corruption. The evening was held in association with Simmons & Simmons and took place at Cipriani in Hong Kong. The event was inspired by ‘Hunting Dragons’, the report co-produced by GC and Legal Business, which ran in the latter earlier this year. How is the Celtic Tiger faring post-GFC? GC speaks to some of the leading in-house counsel profiled in The Legal 500’s GC Powerlist: Ireland to find out.